As such, this comprehensive list of the top 10 best outdoor ping pong tables puts into consideration different needs and, judging from customer reviews, the value, and satisfaction received from owning each table tennis table. Let’s check! The EastPoint ping pong table is a tournament sized table tennis table that can be best described as having the best of all world. Not only is it strong, sturdy and secure, but also looks great and comes at an affordable price. 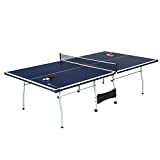 This outdoor ping pong table is suitable for one – four players, making it the perfect choice if you are looking for an inexpensive outdoor ping pong table that can be used competitively as well as professionally. It is foldable, allowing for prime portability and convenience. This foldable design allows for ease of storage. Furthermore, the EastPoint Sports Dominator table tennis table can be adjusted to the playback position. This allows you to practice for hours on end without needing a partner. The net is made of high quality and remains stationary as the game plays on. To increase its portability, it has well-designed, lockable castor wheels. Moreover, the instructions on the manual that comes with it, although somewhat clear, don’t simplify the installation procedure. There are a lot of parts that need assembly, and without professional help, it may take hours to get it up and functional. But the moment you put it together, there is no more hassle. Overall, it is a lovely addition to your game room. The Harvil I table tennis table comes in two pieces to simplify set up and storage. It features a 16mm thick top and adjustable feet to prevent scratching. The table is sturdy and has an aluminum housing to protect the top and prevent accidental denting when moving it around. The powder-coated steel frame hosted by the undercarriage is equipped with four wheels on each side to allow for portability. This portability is further enhanced by its relatively lightweight (just under 150lbs). The Harvil I ping pong table has an easy-to-operate folding mechanism that allows one to practice alone. Purchasing the unit will also get you four bats, eight balls, an accessory bag, a protective cover, and a net. However, the only weakness worth mentioning is its playing surface. Measuring just 16mm, the Harvil I falls on the thinner side of the best outdoor ping pong tables. The standard is 25mm. The thickness of the table plays a great role in getting a “decent” bounce, so if you are looking for a table to use for fun and recreation, then the 16mm is fine. However, if you are looking to play professionally, then you need at least a 19mm-thick table. Specifically designed to withstand all weather conditions all year round, the JOOLA Outdoor Aluminum table tennis table can be used inside or outside, and expect the same quality performance. It offers a consistent bounce even after years of extended indoor, and/or outdoor use. This JOOLA weatherproof ping pong table comes featuring a 6mm plastic synthesized aluminum surface that resists chipping and warping. On top of that, it doesn’t need any maintenance as it is mounted on a powder coated, rust-resistant undercarriage. These add to its already extensive durability, making this a very good family investment. Each leg of this JOOLA weatherproof outdoor ping pong table has adjustable height levelers that help balance it on uneven ground. Also, this aluminum outdoor table tennis table is adjustable to the playback position, giving you the option of playing alone, or with up to three other people. What I really like about this JOOLA Outdoor Aluminum table tennis table is its ease of set up. It arrives at least 95% preassembled, requiring only 15 minutes of your time before the first game. The main selling points of the STIGA Space Saver table tennis table lie in its simple, space-saving design. When you purchase the table, it comes as two separate halves, both of which are fully assembled. To start using it, you need only to unfold the legs and put the two halves together, and you are good to go. So, these two halves make transportation and storage simpler as you don’t have to uninstall and reassemble it every time you need to move it. Measuring a mere 71 by 40.5 by 30 inches, this space saving model is a little below regulation models. It is this compact size that makes it such a great option if you have space constraints. Besides, even though it falls below regulatory standards in size, it has the regulation height, aside from all the other components such as the surface, that is up to standard. The downsides of the STIGA Space Saver table tennis table are mostly a result of quality control issues. Just like other tables, some customers receive tables that have damages due to poor packing for shipment or manufacturing defects. Although more economically inclined, some of the features that are found on the MD Sports table tennis set are more associated with high-end best outdoor ping pong tables. This eight-piece set comes with a removable net, two bats, two balls, and two posts. Mores, it has a 15mm tabletop that provides the finest ball bounce. The MD Sports outdoor ping pong table is exceptionally stable and sturdy, facilitated by the 1/8” apron around the table. Weighing just 121.5 lbs., this unit is slightly heavier than most, reducing its portability. Like some of the above-mentioned models, this table can be adjusted to the playback position, giving you room for solo play. It is this same design that accounts for its ease of storage. If by any chance the performance of the table doesn’t delight you, MD Sports gives a thirty-day money back guarantee to ensure your satisfaction. This is also a sign of confidence in the functionality of their product. As a con, assembling this unit can prove to be a very daunting task. Its many attachments make this a very frustrating procedure that will require additional help. Once you set it up, however, the worst part is over. 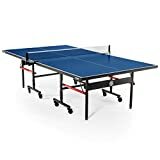 This one of the best ping pong table for outdoor/indoor can be said to be aimed at better functionality to people who cannot afford more expensive models. It is reasonably priced and has features that are aimed at improving the overall user experience. The JOOLA NOVA DX Indoor/Outdoor table is designed to withstand the harshest of weather conditions. It has a 6mm surface made of waterproof plastic synthesized aluminum, and a rust-resistant powder-coated steel frame, making it suitable for outdoor as well as indoor use. Normal indoor models, in a case of extreme weather conditions, will start warping and chipping. Plus, the two halves of this unit can be set up as standalone units or joined for storage purposes. Each half sits on four-wheel trolley systems for mobility, and feature an automatic anti-tilting lock. It is this same lock that allows the unit to be adjustable to the playback position, allowing for solo play. When you purchase the JOOLA NOVA DX table, it comes almost fully assembled and will take 20 minutes to play your first game. This JOOLA product is a very sturdy unit that will serve you and your family for a long period. If you are looking for a recreational and portable ping pong table that is easy to store, then you may have just found this Rally TL 300 outdoor ping pong table from JOOLA a home. It comes with a 15mm charcoal-painted top on top of a 30mm by 30mm rust-resistant powder-coated undercarriage. The four-wheel trolley system with an anti-tilt lock on each separable half accounts for its overall increased mobility. Even when it is playback-adjusted, the unit feels sturdy to the touch and offers great, consistent play. Furthermore, the Rally TL 300 Professional Grade table brings to the table a couple of added extras unseen in other models. To begin with, it has JOOLA patented ball holders that can hold three 40mm balls. With this, you no longer have to run after stray balls in the middle of the game. Second, it has two magnetic abacus scorekeepers at the sides and ends of the table. This will make a wonderful, classy addition to any home. This entry-level indoor table tennis table from the renowned manufacturer, STIGA, is constructed using the finest materials. 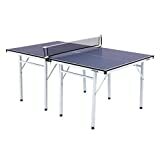 It is a very solid table and with its quality construction and price, it is among the few table tennis tables that pack the best bang for your buck. The STIGA Advantage Indoor table tennis table has a ½” apron that accounts for its warp-resistance. Additionally, its top is professionally finished using automated roller coating, creating a perfect bounce for a consistent play. The easy-release latches featured to allow you to easily switch to and from the playback and the storage positions. The table, in addition to the above, features the quickplay design that is responsible for the simple setup. Setting up the table takes about 10 minutes since it comes 95% preassembled. The net and posts that come with the unit are also simple to install and take off. As a disadvantage, this ping pong table may not be the best option if you are looking for that professional feel. It is an entry level table, perfect for intermediate or beginners. 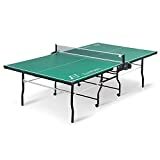 If you are looking for a compact and easy to stored ping pong table, the JOOLA Midsize Compact table tennis table may be just what you need. The main selling point of this unit lies in its compact size and thus, ease of storage. Its table top, measuring just 72 by 36 inches, is about two thirds the size of a professional regulation table tennis table. It, however, stands at 30 inches, which is the regulation height. Also, the two halves that make up the table tennis table are separable and can be used as standalone units. As an effort to look out for the safety of its users, the table was fitted with bumpers at the corners. This sturdy table, on arrival, requires no assembly. The small surface makes it ideal to hone skills as you get ready to move to the slightly bigger regulation table. Mores, the compact size of the JOOLA Midsize Compact table tennis table serves both as for its biggest advantage as well as disadvantage. As an advantage, storing this unit couldn’t be simpler. It folds down to two 3 by 3 feet pieces, which can fit in standard closet spaces. This is a huge plus for people with space constraints. As an obvious weakness, the small size of the unit may turn off serious players looking for full game experience. It is inclined more to the recreational than to the professional side. This outdoor ping pong table is the best for people looking for an occasional fun game. This best outdoor ping pong table was aimed at the top-notch quality at an affordable price. With more than 94% of customers on Amazon being satisfied, it is safe to say that the product delivers. And of course, it being a JOOLA product, it is no surprise that it made it to the top of the list. The JOOLA Inside 15mm ping pong table comes with a 15mm top, separable halves for simplified setup and a powder coated steel frame. Its legs have stabilizers to enable it to stabilize even on uneven ground. You can adjust it into the playback position for some solo play, or fold it down into a compact unit for storage. As is with all other JOOLA outdoor ping pong tables, the surface of the JOOLA Inside 15mm Table Tennis Table is contains professional grade MDF material. This accounts for the consistent bounces throughout its long life. Weighing a mere 137 pounds, this table is exceptionally mobile and portable. On the downside, there have been some reports of the table warping when exposed to high heat and humidity. But I wouldn’t worry about that because if you are this deep into searching for the best table tennis table, you are not about to neglect it and leave it exposed to such extremes. This table will last longest if stored in a cool, dry place. If you are keen, you will notice that true to my word, my all-inclusive list focused on the best outdoor ping pong tables that meet consumer needs. 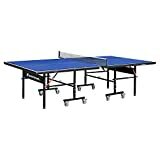 I have looked at both high and low-end, indoor and outdoor table tennis tables. As such, if you were decided on buying a table, you have already found the ideal one on completing this guide.